Watch the mighty Phoenix rise from its ashes to create big win possibilities in the all new Phoenix Sun slot by Quickspin with 243 Ways to win! Phoenix Sun is based on the ancient legends of the Phoenix bird. This mythological creature is said to live for thousands of years, eventually bursting into flames and being reborn from the ashes. Spin the reels of this exciting game to give your bankroll new life! Phoenix Sun has a riveting soundtrack and fantastic graphics. It’s an Egyptian theme which is fantastic because there are still so many real life secrets to be discovered. Winning combinations can be made from Scarab Beetles, Sphinx, Cleopatra, the Pharaoh and Anubis. With regard to features, the Phoenix Wild in this game will trigger reels to open up for re-spins and more bet ways. The game shifts between 3 and 6 rows in height, and 243 to 7776 bet ways. Gather 5 Phoenix Wilds during re-spins and watch them set the reels ablaze, only to rise again along with the sun and a round of 8 free spins. 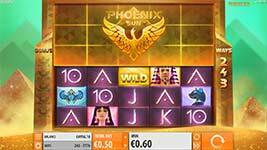 Phoenix Sun – The game starts with a 3×5 reel grid and 243 bet ways. The Phoenix Rising feature can expand the game to as much as a 6×5 reel grid with up to 7776 bet ways. Phoenix Rising Re-Spins – Any Phoenix Wild symbol on a winning bet line trigger the Phoenix Rising Re-spins. Every Phoenix Wild symbol will remove 3 random tiles from the cover above the 3×5 reel grid and trigger a re-spin with the expanded reel layout. The game will re-spin until no more Phoenix Wilds appear in a winning combination for Free Spins is won. Wilds – The golden wild symbol substitutes for all other symbols in the game except the Phoenix Wild. Phoenix Wilds – This symbol substitutes for all symbols in the game but does not appear in Free Spins. Free Spins – When you collect 5 Phoenix Wild symbols in a game round you will win 8 free spins with a full reel grid of 6×5 with 7776 bet ways!